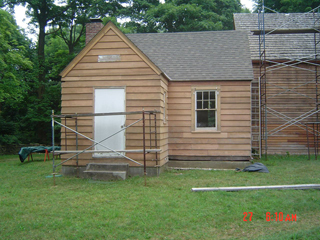 May 2007 Project funded in part by a grant from the Morris County Historic Preservation Trust Fund to complete stripping and treating exterior of the Meeting House; to strip and stain the exterior of the Annex and to repair and preserve the cedar shake roof. The Association made the decision to strip the paint from the Meeting House to return the building to its original treatment. 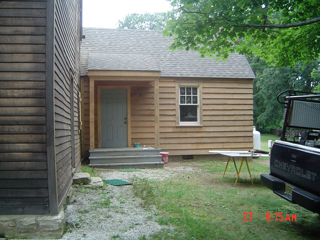 When the Annex also needed painting, the Association decided to strip this buidling as well and to stain the exterior to harmonize with the Meeting House. Work began on the Annex in May 2007 and was completed in October, 2007. View from the South. Annex before and after stripping of paint. View from the West. Annex before and after stripping of paint. View from the North. 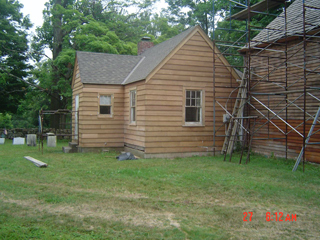 View of Annex before and after stripping of paint.